What is the smallest written interval possible in traditional theory? While most people will say that it is the diminished first, there is no such interval as a diminished first. That is right - there is no such interval as a diminished first! In this blog, we will explore why the smallest interval is always a Perfect 1. We will also learn why a Perfect 1 will always become a half step (semitone) "bigger" to become an Augmented 1 and why it will never become a half step (semitone) "smaller" to a diminished first. What is a Simple Interval? The first thing we need to understand is what exactly is a Simple Interval. A Simple Interval is any interval between a Perfect 1 and a Perfect 8 (inclusive). That means - any interval from a Perfect 1 (the smallest interval) to a Perfect 8 (the largest simple interval). Identify the name of the lowest (lower) note and the name of the highest (upper) note. Identify the interval number. The smallest simple interval number will always be a "1" (a first). Identify the quality of the interval (Perfect, Major, minor, Augmented or diminished) based on the Major Key of the lowest (lower) note. These steps are taught in the Basic Rudiments Workbook starting on Page 60. However, Augmented and diminished intervals are not introduced until page 73 in the Intermediate Rudiments Workbook. What is the Smallest Interval? The "smallest" interval (in traditional theory) is the Perfect 1. You cannot get any closer to a pitch than repeating that pitch using the same letter name. However, intervals can have direction. Time to have fun with Intervals! Play the following intervals on your instrument. Identify the direction of the pitch that you "hear": ascending (step up), descending (step down) or same pitch. Draw a line from each note on the staff to the corresponding key on the keyboard. All the intervals are firsts. If you identified any of them as a diminished first, you will have made a boo-boo. Why is there No Diminished First? So why is there no diminished first? Simple - read step #3 again. That's right, the quality of the interval is based on the Major Key of the lowest note. Not the first note. The LOWEST note. Let's try this again. This time, name the notes (lower note first), and then name the intervals. Before I show you the answers, I want you to double-check - did you write the note with the lowest PITCH as the Lower Note (on the lower line) or did you write the "first note" as the Lower Note? Even though the direction of the pitch may descend (or ascend) when you play the interval, "interval direction" doesn't count when naming intervals! No Diminished First - Direction Doesn't Matter! 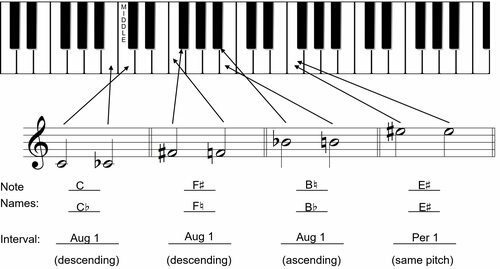 When naming an interval, it can be played ascending, descending, at the same time, or standing on your head - it doesn't matter how it is played or in what order the notes are written! What matters is the distance from the lowest pitched note to the highest pitched note, and the quality based on the Major Scale of the lowest note. So, an Augmented 1st can descend, it can ascend and it can be played harmonically. 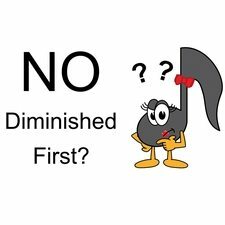 But it will never be called a diminished first as, (repeat after me) there is no diminished first! Again... What is the Smallest Interval? So, let's ask this question again - what is the smallest interval possible in traditional theory? That is correct! (Yay for You!) The "smallest" interval (in traditional theory) is the Perfect 1. You cannot get any closer to a pitch than repeating that pitch using the same letter name. However, intervals can have direction. But direction doesn't matter when naming intervals, doesn't it! Isn't that a neat thing to know?! 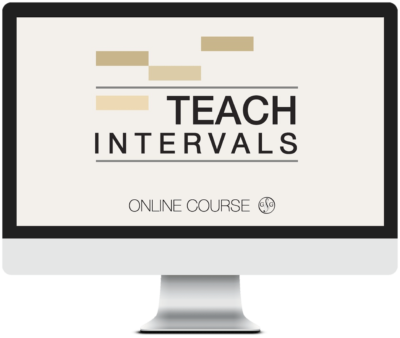 Teach Intervals Online Course is a Teacher Training with 6 Video Sessions plus downloadable worksheets on the What, Where & Why Secrets for Teaching Intervals.